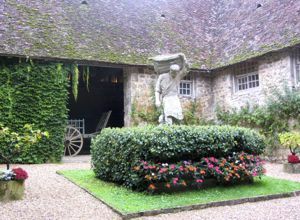 This lovely museum is in the heart of Burgundy, surrounded by vineyards. The original wine farm was built in the 12th century by monks from a nearby Cistercian abbey. 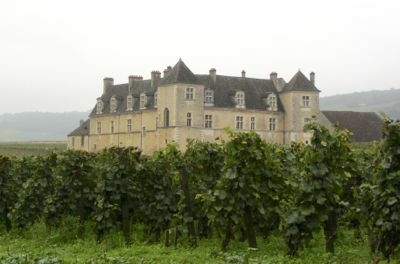 The property was augmented with a Renaissance style château in the 16th century. From the 12th to the 18th century, it was the mother house of the Cistercians and the largest of the Cistercian wine farms. Today's visitors can wander through the old stone buildings with their steep sloping roofs, and see the original kitchens, the monks' dormitories, antique wine presses, a 12th century well, and other historic artifacts. Perhaps most impressive is the large cellar, dating from the 12th century, which has been transformed into a banquet room. Decorated with vine-strewn hods (baskets used to carry grapes), its fun to imagine a banquet going on, with lots of wonderful Burgundy food and wine. Above, Collection of tastevins, symbol of the Confrérie. As part of your visit to the Clos de Vougeot, be sure to watch the excellent video that tells the history of the Clos de Vougeot and the story of the Confrérie. Although some showings may only be in French, you can get enough from the pictures to understand what's going on. After your visit, you can enjoy lunch in the nearby town of Nuits-St-Georges, which has a number of restaurants on the main square of town. Or head up to the tiny town of Gevrey-Chambertin, which boasts more grand cru wines than any other town. Above, Statue of a harvester with a bénaton, a traditional basket for carrying grapes, at the Clos de Vougeot. 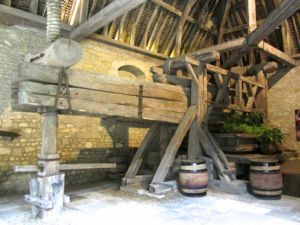 Below, Old fashioned wine press, Clos de Vougeot. 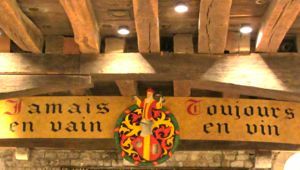 Above, Motto of the Confrérie des Chevaliers du Tastevin, in the 12th century cellar.